Wipe out noise and interference before it gets into your receiver with a 60 dB null! Eliminate all types of noise – severe power line noise from arcing transformers and insulators, fluorescent lamps, light dimmers, touch controlled lamps, computers, TV birdies, lightning crashes from distant thunderstorms, electric drills, motors, industrial processes. It’s more effective than a noise blanker because interference much stronger than your desired signal can be completely removed without affecting your signal. It works on all modes – SSB, AM, CW, FM, frequences from BCB to lower VHF. Null out strong QRM on top of weak rare DX and then work him! You can null out a strong local ham or AM broadcast station to prevent receiver from overloading. Use MFJ-1026 as an adjustable phasing network. You can combine two antennas to give you various directional patterns. Null out a strong interfering signal or peak a weak signal at a push of a button. Easy-to-use! Plugs between transmitting antenna and transceiver. To null, adjust amplitude and phase controls for minimum S-meter reading or lowest noise. To peak, push reverse button. Use built-in active antenna or an external one. 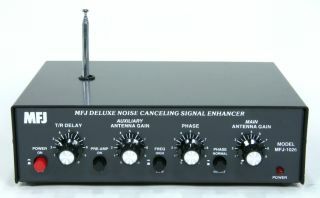 MFJ’s exclusive Constant Amplitude Phase Control makes nulling easy. RF-sense T/R switch automatically bypasses your transceiver when you transmit. Adjustable delay time. 12 VDC or 110 VAC with MFJ-1312D. Measures 6 1/2 X 1 1/2 X 6 1/4 inches.